In a fast-paced and ever-changing city like Mumbai, we have to look to art to get a glimpse of the country’s history and how it continues to evolve. And that’s exactly what the art scene in Mumbai offers: a mix of history as well as contemporary works by well-established local and international artists as well as emerging ones. If you like discovering art in various forms, then Mumbai will surely be a hit with you. From sculptures to paintings and photographs to even performance art, we bring you the best art galleries in Mumbai. At over 50 years old, this is one of the city’s oldest and most prestigious art galleries and is loved by locals and tourists alike. This gallery boasts a large loft space and showcases a mix of art from renowned painters and also provides a platform for newer artists. Here you can see the works of Shilpa Gupta, Atul Dodiya, Nalini Malani as well as Dhruvi Acharya, Shezad Dawood. The legendary artist MF Husain was also a big supporter of this gallery. Volte may be one of the newer art galleries but it has already managed to make waves in the art scene in Mumbai. Volte represents a number of South Asian and international artists and boasts of a mix of art including video, performance and installations. Much of the credit goes to owner Tushar Jiwarajka who is known for his eclectic taste. Some of the past exhibitors include Ranbir Kaleka, Nalini Malani, William Kentridge, James Turrell, and Wim Delvoye. Volte has also been featured in the New York Times. This art gallery in Mumbai is a must visit for anyone who enjoys art and culture. Founded by the husband and wife duo Mortimer Chatterjee and Tara Lal in 2003, Chatterjee & Lal is a much-loved addition to the Mumbai art scene. In fact, it was one of the first to feature a performance art installation. Its main focus is on young, emerging artists who work mainly in India. They have showcased everything from vibrant ink-based works to computer-generated scribbles as well as creating installations in non-traditional spaces. A visit to this stunning art gallery in Mumbai will be fun and action-packed. This sprawling space was set up in 2000. Located opposite the beautiful Worli sea face, there are two galleries owned by curator, connoisseur, collector and philanthropist, Kalpana Shah. Tao showcases a large range of art including painting, photography, sculpture, video, performance as well as installation arts. They have also curated international shows in London, Tokyo and Singapore for International Institute of Fine Arts. 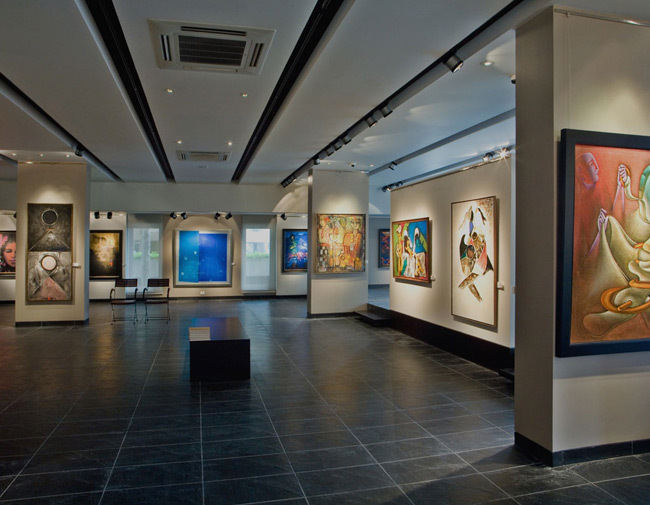 The gallery offers art patrons a chance to view some of Mumbai’s finest works in a very relaxed setting. When one talks about the art scene in Mumbai, this gallery always gets a mention. Founded in 1952, the art gallery has four halls, including one for photography. They have showcased the works of leading artists such as MF Husain, SH Raza, Akbar Padamsee, Ram Kumar, Anjolie Ela Menon and KK Hebbar, among others. The building itself is steeped in history as it is one of the early arty structures in Mumbai. With over 300 shows annually, Jehangir is a must-see art gallery in Mumbai. While planning a trip here, you can also visit the Prince of Wales Museum which is located nearby. One of India’s earliest art galleries, dating back to 1963, the Pundole Art Gallery is still considered to be a vital part of the country’s art scene. It has promoted and supported a number of leading artists such as MF Husain, VS Gaitonde, Ram Kumar, Akbar Padamsee, KH Ara, FN Souza and Krishen Khanna. In fact, the gallery still features a huge mural done by MF Husain. They host exhibitions, publications, art education that aim to promote modern and contemporary Indian art. Previously called the Victoria & Albert Museum, this gallery is worth a visit for the architectural splendour of the building. You will see a pastel and gold stucco and stencil work on this impressive building. The permanent collection showcases India’s history but, the main attraction is usually the contemporary artist’s exhibitions such as Sudarshan Shetty and Sheba Chhachhi as well as performance artwork by Nikhil Chopra. Spread over 4000 square feet, this art gallery is built in a former 19th-century printing press, which means it has a large range of work on display at any given time. Project 88 is famed for its immersive exhibitions and performances, and boasts many collaborations with other galleries, both in India and overseas. They have showcased works of artists such as Bharti Kher, Hemali Bhuta and Sarnath Banerjee. The architecture of the gallery is also worth looking out for with curved metal beams and iron pillars stand on display. If you’re looking for a range of art: from drawings to video and sculptures to graphic novel art, this is the gallery for you. A very popular art gallery in Mumbai, it’s as avid a traveller as you! That’s what you will find at Sakshi Gallery, which is run by Geetha Mehra. It has locations in Bangalore and Chennai, as well as three locations in Mumbai: an apartment on Altamont Road, a mill in Lower Parel and finally a Colaba mansion block (it’s flagship space in Mumbai). Mehra has even opened a branch in Taiwan, in case you happen to be visiting there, too. Sakshi has held exhibitions for a number of renowned Indian as well as international artists. They don’t shy away from bold work, either. This is a must-see gallery during your Mumbai visit. This art gallery, run by mother and daughter duo Usha Mirchandani and Ranjana Steinruecke, boasts exhibitions by internationally celebrated artists as well as a rotation of upcoming local talent. 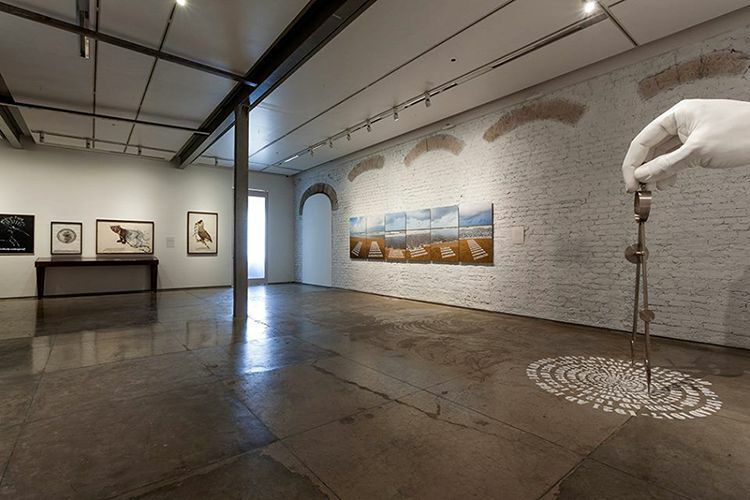 Wolfgang Laib, Sigmar Polke, Kiki Smith, and Jonathan Meese have exhibited here and some of the local artists the gallery represents include Manish Nai, Varunika Saraf, Abir Karmakar and Ratheesh T.
It offers a quaint vibe as you have to ring a doorbell to enter. But once inside, you’ll be treated to a very minimalistic look and find that the 2000 square foot space has a very international feel to it. It is close to the Taj Mahal Hotel and Gateway of India, so do visit these two iconic spots as well. Based in a former grain factory, the first thing that strikes you about this space is how impressive it is. With 50 foot high roofs and walls that run 100 feet in length, Gallery Maskara shows off a number of larger than life art installations, including a large floating dolls collection by Canadian sculptor Max Streicher, which marked the gallery’s opening. Owner Abhay Maskara main aim is to show off the works of bold and radical artists – you could find anything from huge dung sculptures and soaring graffiti art to mercury-filled sculptures within these walls. If you’re an art connoisseur who enjoys discovering emerging artists and admiring well-established ones, then check out these popular art galleries in Mumbai. Let us know about your experience and personal recommendations in the comments below.